An aluminium flashlight with a standard light bulb and a split ring. 1 AAA battery packaged separately. 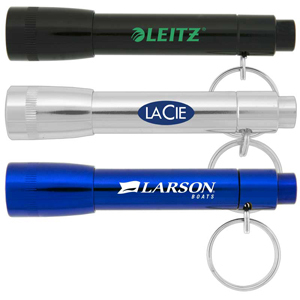 Price includes choice of laser engraving or one colour pad printed logo. We recommend laser engraving. Printing may fade over time. Individually packaged in a white box.